Soak 16 (12-inch) wooden skewers in water at least 20 minutes before assembling kabobs. Preheat broiler. Coat rack of broiler pan with nonstick cooking spray; set aside. Combine teriyaki sauce, ketchup, sherry, peanut butter, pepper sauce, and ginger in small saucepan. Bring to a boil, stirring constantly. Reduce heat to low; simmer, uncovered, 1 minute. Remove from heat; set aside. Cut each bell pepper lengthwise into 4 quarters; remove stems and seeds. Cut each quarter crosswise into 4 equal pieces. Thread 2 shrimp, 2 bell pepper pieces, and 2 sugar snap peas onto each skewer; place on prepared pan. Brush with teriyaki sauce mixture. Broil skewers 4 inches from heat 3 minutes; turn. 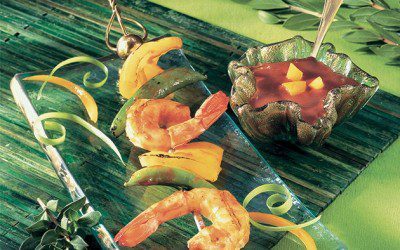 Brush with teriyaki sauce mixture; broil 2 minutes or until shrimp turn pink and opaque. Discard any remaining teriyaki sauce mixture. Carbohydrate choices: 1 Vegetable, 1 Meat.